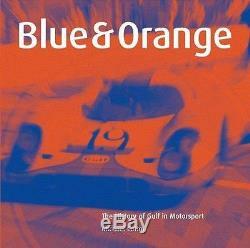 Blue & Orange - The History of Gulf in Motorsport Limited Edition No. 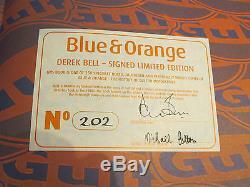 202/250 signed by Michael Cotton and Derek Bell. This book tells the story of Gulf Oil and a history of motor racing sponsorship that stretches back to the 1930s. This lavishly illustrated, large format full colour book focuses on the drivers, the cars and the events associated with the Pittsburgh company and their famous logo through the best part of 70 years. The story begins with Harry Miller's "Indy 500" challenger which, in 1937 was a hugely innovative mid-engined single-seater that boasted nothing less than four-wheel drive and disc brakes! In 1966 Gulf Oil vice-president Grady Davis formed a lasting friendship with John Wyer, the race car constructor based in Slough. This racing partnership lasted nine eventful years and was perhaps, the most successful commercial partnership there has ever been in endurance racing, the Gulf Ford GT40's winning the 24-Hours of Le Mans in 1968 & 1969. Followed by two more successful seasons representing the Porsche factory. This was truly the golden era of sports car racing. Pedro Rodriguez and Jo Siffert established records everywhere they raced the Gulf Porsche 917s, and their exploits at Le Mans, Spa, the Nürburgring and Daytona are now legendary. Steve McQueen's film "Le Mans" gave the Gulf Porsche 917 an iconic status and one chapter focuses on "Le Mans" with photographs and stories of Steve McQueen, never seen before. The team ran in the BPR Global Endurance Championship and were once again successful, with Bellm winning the championship in 1996. In their centenary year, Gulf Oil sponsored an Audi R8 in which Stefan Johansson won the Le Mans Endurance Series. 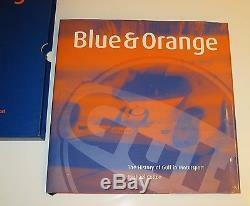 The story of this campaign is the final chapter in "Blue & Orange". Hardcover im Schuber, 28 x 27,5 cm, 208 Seiten, 170 farbige und 80 s/w-Abbildungen, englischer Text. Gesuchte Rarität, sehr guter Zustand. Rare and hard to find out-of-print book, very good condition. 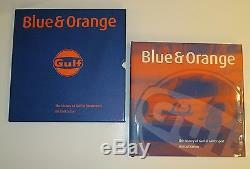 The item "Blue & Orange History of GULF in Motorsport limited signed edition book Buch" is in sale since Thursday, July 20, 2017. This item is in the category "Auto & Motorrad\ Teile\Automobilia\Anleitungen & Handbücher\Sonstige". The seller is "www_disch-fachbuchhandlung_de" and is located in Hamburg. This item can be shipped worldwide.